In my earlier work, I was driving the efforts to optimize the free trial experience of a SaaS product. The key objective was to increase the free trial conversion rate. We first tried to fix the low hanging fruits by evaluating the first-time customer experience with the product. We came up with a structured onboarding flow, video tutorials, relevant lifecycle communications and a clear call-to-action to experience early wins. We also evaluated if there are any friction points in the prospect's first run with the product and fixed those as well. These worked well for prospects who were willing to take the time out to evaluate the product. If we map this to BJ Fogg's behavior model B=MAT, the prospects were high on motivation (M) ; we increased their ability (A) by fixing the above mentioned product gaps and sent appropriate triggers (T) through lifecycle communication strategy. So the expected behavior (B) of "going through product free trial and experiencing value" occurred, resulting in a positive impact on conversion rates. But there was a good pipeline of prospects who weren't so keen to try out in the first place, even though they liked the product demo. When we analyzed the not-so-apparent behavior of such prospects, it was clear that their motivation levels to try out and make a decision were very low. It would be extremely helpful to get a sense of prospects' motivations before-hand, so that we can come up with a reliable model to predict the free trial experience and expected conversion rates. In order to understand their "motivations", we took the help of the popular task prioritization framework devised by Stephen Covey in his book "First Things First". 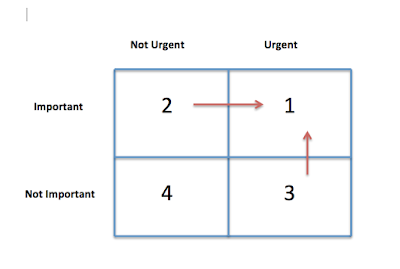 It comprises of a simple 2*2 matrix with Urgency on the X-Axis and Importance on the Y-Axis. These 2 parameters have a direct correlation with a prospect's behavior during free trial. Prospect has a need/problem/issue/opportunity in hand (Bundling all these together as N) and he is looking for a possible solution. Only when both these parameters are HIGH, we found that the prospect's motivation to pursue the free trial is high. To apply this framework for your product's free trial strategy, I suggest that you get enough context on both these parameters before you decide on whether a prospect is a suitable candidate for free trial. As part of the lead qualification process, define and get answers to relevant questions which will help you understand these 2 parameters from the prospect's point of view. Once you have the required insights, you can then map the prospect into one of the 3 segments as below. When both these parameters were HIGH, the probability that the prospect will be interested in progressing through the free trial is also high. So make sure you give the highest priority to such prospects in this quadrant. The main action items here are to provide a seamless experience and to showcase the perceived value relevant to "their" requirements. Many of the prospects in the free trial pipeline understand the importance of the problem to be solved. They also have some idea on the impact of this problem in their business unit / organization. But they are busy with other immediate priorities and don't have the required bandwidth. So they end up procrastinating / delaying the solution evaluation to next month (or next quarter). For such prospects, the best way to get them to experience value from your product is to make the free trial evaluation process so easy and simple that they get to experience quick wins without much effort. If the prospect comes with a perception that the evaluation will be time consuming, try to see if you can share their workload. Manual configurations, data uploads, data syncing, code integration, content creation etc - basically any effort they need to put from their side in order to evaluate your product. There could also be an alternate scenario where the head/leader of a certain business unit wants to start looking for a solution before the need hits them hard. But the leader delegates the solution evaluation to their team who don't seem to have the bandwidth to commit time or effort (however little the required might be). For such prospects, keep in touch with the leader to be on top-of-mind recall, share case studies on impact you have made in other customers' business outcomes, share contacts of reference customers from similar businesses/industries with whom the prospect could relate to. 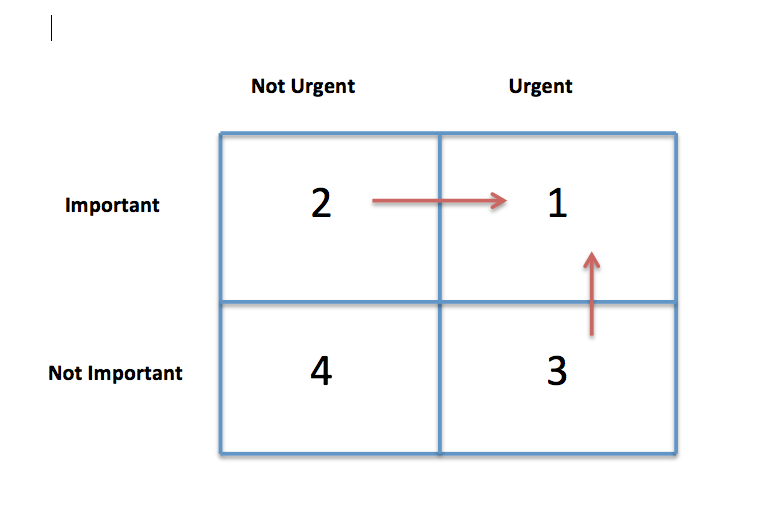 The key objective here is to move the prospect from Quadrant 2 to Quadrant 1, without creating any "artificial" urgency. Rather, it makes sense to give an alternate perspective on how the need if fulfilled now rather than later can lead to better business outcomes. More on the lines of creating "hope" than "fear". At first glance, this quadrant may not make sense. But this is quite possible in cases where your prospects are looking to sort out compliance or quality audits. Also in some cases, the initiator persona understands that the problem to be solved is urgent but the other stakeholders (especially those up in the hierarchy) don't seem to give that much of an importance, given their other priorities. In such a scenario, ensure you get full buy-in of the initiator persona and make him/her a champion within the organization. Help him/her build a crisp business case that he can present to the leaders of his organization. The key objective here is to move the prospect from Quadrant 3 to Quadrant 1. Understanding the prospects' business model, their present challenges, industry dynamics and presenting a big-scale impact and ROI will certainly be more helpful. I find this exercise challenging but I have also seen how much of an impact and value it could create for your prospect. Hope this framework helps you to segment your free trial prospects and also gives you some clarity on your plan-of-action for each of these segments. Do share your comments and questions if any.